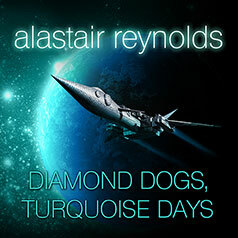 From Alastair Reynolds, author of Absolution Gap, comes two novellas set in the Revelation Space universe. In the seas of Turquoise live the Pattern Jugglers, the amorphous, aquatic organisms capable of preserving the memories of any human swimmer who joins their collective consciousness. Naqi Okpik devoted her life to studying these creatures—and paid a high price for swimming among them. Now, she may be the only hope for the survival of the species—and of every person living on Turquoise . . .